Since the end of World War II, there have been six world oil supply disruptions, in 1951, 1956, 1967, 1973, 1979, and 1980-one year in six, and the frequency seems to be increasing. This danger will continue, for there are many sources of disruption. Although the probability of any one type in any one year is low, the chances of escaping them all for several years are also low. Energy taxation is more complex and more controversial in Canada than in most or all other countries, for three main reasons. First, under the constitution, most natural resources are owned by the provinces, with important powers of regulation and taxation in the hands of the provincial and federal governments. Second, energy resources are very unevenly distributed among the provinces. Alberta, with less than 10 percent of Canada's population, accounts for 85 percent of Canada's nonfrontier onshore crude oil and natural gas. Finally, the Canadian oil and gas industry is largely foreign-owned and foreign-controlled. In its quest for additional revenue, the U.K. government has made a major change in the taxation system for North Sea oil fields. A new tax, the Supplementary Petroleum Duty (SPD), has been introduced, and the terms of the Petroleum Revenue Tax (PRT) have been tightened. The new tax system was introduced in March 1981 but was effective as of January 1, 1981. The new system has been criticized on the basis that it would substantially reduce the incentives to develop smaller fields and that it tends to discriminate against U.S. oil companies. This paper examines these criticisms. It analyzes the economics for a U.K. company of developing an oil field by field size. It then shows the changes in these economics created by the new U.K. taxation system. The final section of the paper deals with the interrelationship between the U.S. and U.K. tax treatments of North Sea oil. Nuclear Power for Developing Countries: Attainable Within This Century? To use or not to use nuclear power for generating electricity has, in many parts of the world, become as much an emotional issue as an economic or technical one. Probably this is even more so in developed than in developing countries. The menacing worldwide energy misallocations and shortages have been the subject of a number of conferences, workshops, articles, studies, and - in the United States at least - of pronouncements by advocates ranging in style and substance from Jane Fonda to Barry Commoner to Edward Teller. It is not necessary to take sides here on the narrower question of whether any country in particular should try to use nuclear power for electricity or should try to avoid it. But except perhaps for antinuclear diehards, surely anyone concerned with the plight of developing countries, whose other energy resources are often wholly inadequate, must be interested in finding a satisfactory way to open up for those countries, or to keep open, the nuclear option. 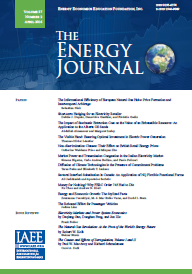 Recent theoretical and empirical research has focused on the effect of public utility commission (PUC) regulation and its associated "regulatory climate" on the cost and availability of capital to regulated investor-owned electric utilities. These studies show that in general, the more unfavorable the regulatory climate, the higher the cost and the less available is external financing to the regulatees in a PUC jurisdiction. The last decade has brought dramatic changes in U.S. energy policy. These changes provide fertile ground for research. Perhaps nowhere is this more true than in the petroleum sector, where develop-ments since the Arab oil embargo of 1973 have been accompanied by major alterations in the direction and scope of federal involvement. The ready availability of both relevant data and tried-and-tested methodologies facilitates scholarly investigation of the effects of post-embargo federal petroleum policy. To be sure, the opportunities for these investigations are not being passed up. Encouragement of investment in domestic energy projects capable of displacing imported petroleum is a central objective of U.S. energy policy. Private industry will be the primary vehicle for developing improvements in efficiency of new technologies, reducing costs to levels competitive with conventional technologies, and building the required industrial infrastructure. In their article "Industrial and Commercial Demand for Electricity by Time of Day: A California Case Study," Chinbang Chung and Dennis J. Aigner present an econometric model of industrial demand for electricity by time of day and attempt to estimate relevant price elasticities.